On Tuesday, 21st of June, Architecture Fund is inviting everyone to join the walk by the river Neris together with architectural theory and history professor Peter Lang. The walk will be a continuation of Peter Lang’s talk ‘Stalker: Ground Walk’ (June 20th, National Gallery of Art, Konstitucijos av. 22, Vilnius, from 20:00), during which the professor will discuss the work of the Roman group Stalker. Where? The walk will start from the Transport police building (Giraitės g. 3) and will finish at ‘Rupert’ centre for art and education. Distance – 16 km. When? The walk will start from 13:00. Duration: 4-5 hours. Registration: Everyone willing to join the walk must register by sending email to archpaskaitos@gmail.com by noon on Monday, 20th of June. 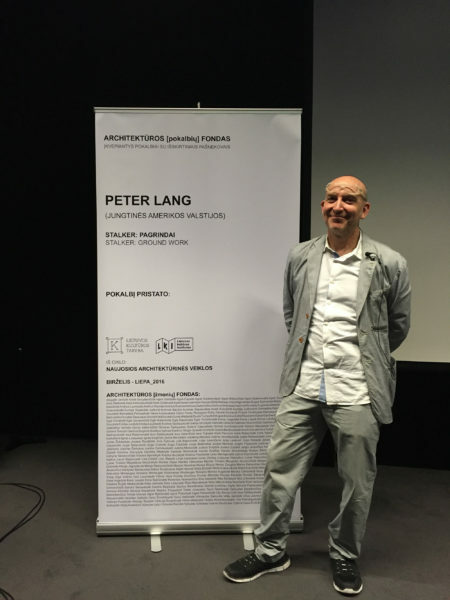 Peter Lang is professor in Architectural Theory and History at the Royal Institute of Art, in the Department of Architecture, Stockholm (Kungl. Konsthögskolans-KKH), where he conducts post-graduate research courses in architecture, design and multi media communications.Lang holds a Bachelor in Architecture from Syracuse University and earned a PhD in Italian history and urbanism at New York University in 2000. He is a Fulbright recipient in Italian studies. Lang works on the history and theory of post-war Italian architecture and design, with a focus on sixties Italian experimental design, media and environments. He has been a member of the Rome based urban arts research group Stalker since 1997. The discussions during the walk will be held both in English and Lithuanian languages. Participation is free of charge. The walk is sponsored by Lietuvos kultūros institutas and Lietuvos kultūros taryba.